Receiving dentures in Granger can be a time-consuming process, but the benefits can make treatment well worth it. During an initial visit, your dentist will craft impressions of your teeth and bite, ensuring your appliance perfectly replicates your mouth’s natural function. If required, damaged teeth will be removed and you’ll obtain a temporary device to wear in the short-term. Those who are receiving an implant-supported denture will need their implants positioned before the permanent device arrives. When the permanent denture is finished and your mouth has healed from any preliminary care, your dentist will fit and adjust the appliance. Call us now if you have any questions about the dentures procedure. What Denture Choices Are Available? Full dentures can replace a complete arch of teeth and their surrounding tissues in either the lower or upper jaw. Best for those who are missing most of their teeth, these appliances are typically constructed with acrylic, porcelain, or metal. A full denture can be secured in place using bonding adhesive or fixed into place using dental implants. It’s important to remove your denture each evening for cleaning. If you are missing only a small section of teeth, a partial denture may be an excellent choice. Partials are similar to a dental bridge in that they are attached to surrounding healthy teeth. The artificial teeth are usually placed on a frame, and the appliance can be removed by unhooking the metal clasps on each side. Unlike traditional partials, a flexible partial doesn’t include metal clasps or a rigid acrylic base. Instead, it’s constructed using a lightweight material that is comfortable to wear. The clasps are gum-colored, creating a realistic and discreet denture-wearing experience. While a traditional denture uses adhesive to remain secured on the gums, an implant-supported denture uses a different approach. These appliances rely on strategically placed dental implants to remain secure in the mouth, creating a stable wearing experience. Implant-supported dentures are less likely to slip or become dislodged when eating and speaking. They’re also easy to remove for nightly cleaning. Getting new dentures is a fully personalized procedure; because of this, the dentures cost will vary from person to person. Typically, the cost is determined by the type of appliance chosen, the amount of preliminary treatment needed, and the materials used. If you’re considering restoring your smile, call us now to discuss our affordable denture choices. Dentures are durable and natural-looking replacements for missing or severely damaged teeth. They consist of a row of pontic teeth that is attached to a permanent implant or removable frame. Wearing a denture can significantly enhance your facial structure, jaw function, and self-confidence. If your dentures have become uncomfortable, a soft denture reline may be an effective solution. This affordable treatment involves the dentist resurfacing the underside of your appliance with a flexible material. After treatment, the material can stay pliable for up to two years. 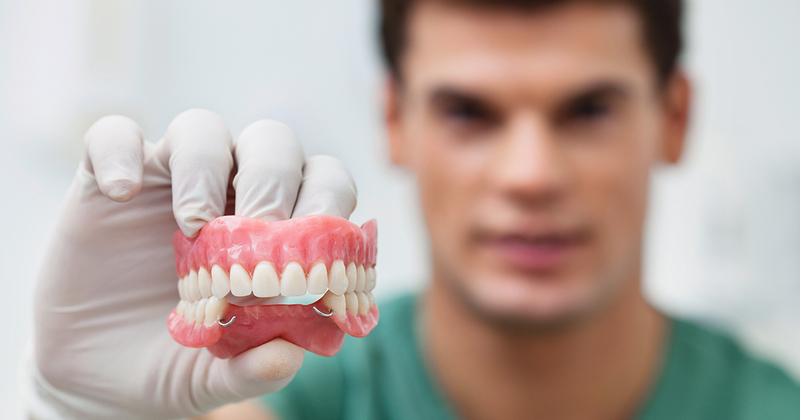 What Is the All-on-Four Dentures Procedure? With the All-on-Four implant method, you can obtain a full arch of pontic (artificial) teeth that are permanently affixed to dental implants. This option is great for those who desire a permanent, secure hold and excellent biting power. Give us a call to learn more about this innovative approach to dentures.